At Lincoln Ristorante, we offer our interpretation of modern Italian cuisine in New York at Lincoln Center. Located inside Lincoln Center’s Metropolitan Opera House, it is a tribute to elegance and artistry. 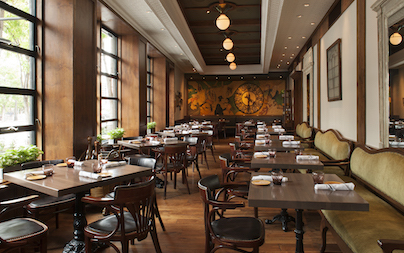 Brasserie 8½ is a stylish French brasserie just steps from Fifth Avenue. The Rink at Rockefeller Center is the classic NYC ice skating experience. Explore ice skating prices and schedules and reserve tickets online. Offering take-out and eat-in lunch and dinner from a diverse market selection of freshly prepared, home-style Mediterranean culinary classics. Located inside the MetLife Building in Midtown NYC, Vanderbilt Suites is ideal for business meetings, corporate functions, and social celebrations of every kind. Cucina Express provides exceptional coffee and an upscale quick service menu featuring artisanal sandwiches, salads and freshly baked pastries. Rowland's Bar & Grill is a modern gastropub restaurant serving burgers and American food with a lively happy hour, located in Macy's next to Penn Station. Voted "one of the Top 10 best steakhouses in New York City," Nick & Stef's is a masterful blend of ultra-stylish contemporary design and time-honored steakhouse artistry. Yellow Magnolia Café is open to Brooklyn Botanic Garden. We are updating our site to include details on events and catering at Brooklyn Botanic Garden. Panevino Ristorante is an Italian restaurant in Livingston NJ serving lunch, dinner, take out & catering with an outdoor patio for dining & private events. 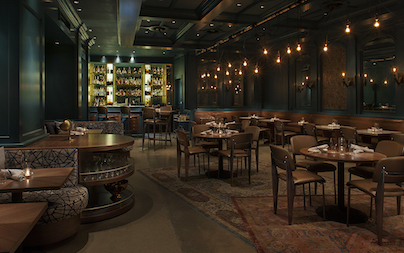 Patina 250 offers casually refined, eclectic cuisine with a devotion to wood-fired cooking. Open for breakfast, lunch, dinner and weekend brunch. A swinging speakeasy that pours Prohibition-era cocktails and serves hearty Roman inspired dishes, including handmade pasta, steaks and the signature Salumi e Formaggi platter of cured meats and aged cheeses. A stunning setting serving authentic Sicilian inspired fare of handmade pastas, steaks, fresh fish, hand crafted cocktails and a special selection of Italian wines. Serene Adult dining is available in the First Class Lounge. Serving Sicilian-style pizza and an assortment of handmade sandwiches and salads and Italian beverages for lunch, dinner and late night. Breakfast offerings include Italian pastries, Breakfast Pizzas and savory sandwiches. Providing flavors from across Asia, while exhibition kitchens showcase the continent's traditions including street-food stalls, Peking duck carving and dim sum. A multi-level "industrial Gothic" restaurant and entertainment venue serving classic American fare, including Prime Rib and the incredible The Edison burger. On weekends it transforms into an Adult-only cabaret from 10pm till late. Celebrity chef Joachim Splichal's Italian dishes in a refined dining room with old-world atmosphere. Located in Epcot park and offers authentic Italian cuisine, including hearty pastas and wood-fired pizzas. Tangata Restaurant serves a Pacific Rim lunch menu at the Bowers Museum in Santa Ana, and also offers wedding and event catering. Offering seasonal, freshly made items for breakfast, lunch and snacks from six gourmet culinary experiences. Leatherby’s Cafe Rouge is a modern steakhouse serving pre-show dinner at Segerstrom Center for the Arts in Costa Mesa, Orange County. Serving weekday breakfast and lunch, plus performance day lunch and dinner, George's Cafe is situated at Orange County's cultural epicenter, Segerstrom Center for the Arts. Taqueria at Tortilla Jo's in Downtown Disney Anaheim is a Mexican fast food dining restaurant serving tacos, nachos, burritos and breakfast to go with outdoor dining available. Serving create-your-own pizzas, pre-packaged sandwiches and salads, italian desserts, bottled and fountain non-alcoholic beverages, beer and wine. Tortilla Jo's is a Mexican restaurant and tequila bar in Downtown Disney Anaheim offering outdoor dining and a large private event space. Uva Bar & Cafe next to Catal Restaurant in Downtown Disney Anaheim serves breakfast, lunch and dinner featuring an outdoor bar serving craft beer and hand crafted cocktails. Naples Ristorante E Pizzeria is an Italian restaurant and bar in Downtown Disney, Anaheim serving pizza with outdoor dining in a fun family atmosphere. The café offers a delectable selection of soups, salads, sandwiches and wraps, as well as snacks and desserts. Descanso Gardens is one of Southern California's most magical botanical delights, an ideal backdrop for any event; also home to the new Maple Restaurant. LACMA Cafe offers museum goers lunch options including gourmet sandwiches, salads, pizza and more in a casual restaurant atmosphere. Ray's and Stark Bar at LACMA is a casual dining restaurant in Miracle Mile, Los Angeles serving seasonal fare and favorites for lunch, dinner & happy hour. C+M (Coffee and Milk) at LACMA is a popular cafe serving Intelligentsia coffee and small bites, located next to Urban Lights by the La Brea Tar Pits. C+M (Coffee and Milk) at Westwood Gateway is a cafe in West Los Angeles, serving Intelligentsia Coffee, espresso, lattes and other specialty beverages. Featuring healthy breakfast items, artisan sandwiches, salads, soups, and freshly baked pastries. Kendall's Brasserie at The Los Angeles Music Center is a fine dining French restaurant featuring fine wines, cocktails & oyster bar in downtown LA. Tucked under the Dorothy Chandler Pavilion, set adjacent to the celebrated Kendall’s Brasserie. Patina is a Michelin starred French restaurant at the Walt Disney Concert Hall, considered by many as the pinnacle of fine dining in Downtown Los Angeles. Located in the heart of Los Angeles Art’s District, Patina Restaurant Group offers a variety of dining experiences to satisfy every tastebud. Inspired by the flavors and unique spirit of Mexico City, Cocina Roja is the ideal outdoor dining restaurant for Mexican cuisine when visiting The Music Center. The quintessential L.A. burger joint that brings a new casual dining option to The Music Center. Nick & Stef's Steakhouse is a fine dining restaurant in downtown Los Angeles, offering prime steak and seafood by James Beard Award winning Chef Splichal. Cafe Pinot is a fine dining California French inspired restaurant in downtown Los Angeles offering outdoor dining as well as event and wedding catering. Market Café at 550 S. Hope St.
Stop in for a coffee break and enjoy our Intelligentsia coffee and espresso drinks complemented by our sweet and savory pastries that are baked fresh daily. Market Café offers seasonal, freshly made items for breakfast, lunch and snacks. 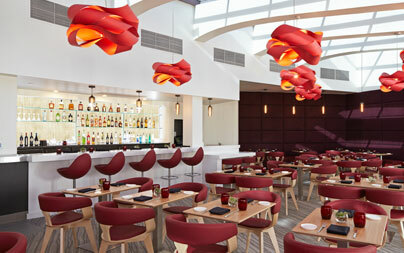 Enjoy our Modern American Cuisine created by an award winning combination of two innovative restaurants.